The Devil and Daniel Johnston in theatres or on DVD? Hey, I'm just wondering if anyone knows when this movie will be seeing some kind of distribution either in theatres or on DVD. I recall a post in which somebody said Sony Picture Classics had picked up the movie for distribution. Have they made any of their plans public? I would really like to see this documentary, but I don't live in Texas, California, New York or Germany, and I didn't attend The Sundance Film Festival. So when is an average Joe boxer like me gonna get to see it? The official website, http://thedevilanddanieljohnston.com/ has basically no information. And that clip of Daniel at McDonald's has never worked. 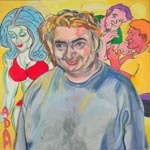 Re: The Devil and Daniel Johnston in theatres or on DVD? The reason the clips dont work is prolly because I burned them up by watching them oh................several dozen times!!!! Just those four clips are great! I cant wait to see it! I have heard that it will be released on DVD and it will have lots and lots of extra goodies but that was all I was told! Jeff T could prolly enlighten us! Or perhaps the Devil can chime in! Anyways its on my most wanted list when it finally comes out! I'm really hoping for a Jeff Feuerzeig / Daniel Johnston commentary track on the DVD. And maybe some bonus concert footage. I've managed to get the clips to work ok, including the McDonalds one , they are in Flash if that's any help - it might be an idea to check if you have the most current version on yr computer.. I think the plans remain as they have been since previous announcements in March - movie in theatres by the end of 2005, DVD in early 2006. Allow a six month possible delay just because the film industry is what it is. I can throw in this somewhat-informative tidbit: The night before last I got an email from director Jeff Feuerzeit asking for help in locating the owner of the master tapes for the "Woodshoock 1985" LP, in the interest of putting "Marching Guitars" on the "Devil & DJ" soundtrack CD. Coincidentally enough, the person he was looking for is Jeff (yes, ANOTHER Jeff!) Smith, who happened to be the very next person I needed to send an email to! I'm providing the liner notes for Jeff's upcoming "two-fer" CD reissue of the Hickoids' "We're In It For the Corn"/"Hard Corn", and I had logged on specifically to let Jeff S. know how the writing was coming along! I continually find myself being amazed at how small the internet has made the world. Wow. Those clips are astounding - I was beginning to think I'd never see Daniel's appearance on Cutting Edge, and after picturing how it might've been for goodness knows how long, it's so wonderful to be able to finally see it. I'm even more anxious to see this film than ever, if that's possible. (The McDonald's clip doesn't work for me either). i am so excited to see this. but do you realize how many people will start liking him? not that i care or anything, it can even be a good thing. maybe they'll actually distribute his cd's in pennsylvania.